Blue whale tours in the Azores. Helping Dreamers Do. The Azores are among the best places in the world to see many different cetacean species in their natural habitat. Blue whale tours in the Azores track these vast, majestic and mysterious creatures as they migrate to the Arctic, and if luck is with you, promise an unforgettable experience. They are the largest animal, by far, on our planet and quite possibly the largest that ever lived. Adults can weigh up to 200 tons and reach 24 metres in length, and their tongues alone can be as heavy as a full-grown elephant. So even if you’ve never been near the ocean in your life, you’ll know a blue whale when you see one. These immense creatures have an almost mystical quality to them. Their gentle nature, complex behaviours and social structures – plus the fact that, because they dive so deep, we still know relatively little about them, makes them very intriguing. We’re lucky in fact that we’ve still got them around. Blue whales remain endangered, having almost been wiped out by hunting and now regularly killed by ship strikes and discarded fishing gear. Normally observed travelling alone or in pairs, blue whales move at around 20km per hour, and their blows can reach up to 12 metres, which alone is a very impressive sight. You may not always get a great view of the whales – in fact, a responsible tour operator will never get too close – but just being in their presence for a little while can be a very humbling experience. Why go blue whale watching in the Azores? The Azores, a volcanic archipelago in the North Atlantic, is a world-class destination for dolphin and whale watching with many species passing through its deep waters every year, including blue whales. Both the BBC and National Geographic have chosen to film here, giving some indication of its prestige, and it is also a very well-managed destination, crucial not only for the whales’ wellbeing, but to ensure that you have a worthwhile experience. Small group tours are usually accommodated on either São Miguel or Faisal, returning to land each afternoon as opposed to live-aboard trips. Whale watching might be the focus of your trip, involving daily departures, or form part of a more diverse itinerary. If you want to get more in-depth you can also take part in a scientific conservation project, led by a team of biologists to collect ecological data accruing various skills such as whale identification and educating members of the public on behaviours. Trips are often accompanied by expert marine biologists there to provide a fascinating commentary on what you’re seeing. You will sail either in Rigid Inflatable Boats (RIBs – not suitable for people with back complaints) or catamarans, which may be assisted by land-based whale spotters (vigias) in purpose built towers which were once used for whaling. While sightings can of course never be guaranteed, success rates are high and there are always many other marine species to be seen. Naturally, we carefully screen all tour operators on our site to ensure their responsible whale watching practises are up to international standards. You can have confidence that these trips present no harm to the whales, and also have a positive effect on their conservation. Whales are most commonly seen off the Azores between April and August. 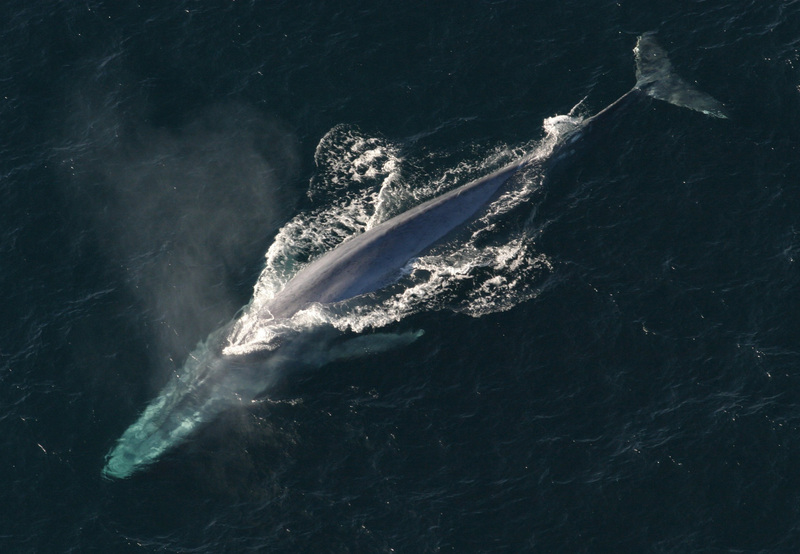 Blue whales, like other baleen species such as humpback and fin whales, are drawn by the plankton blooms that appear between mid-March and mid-June, filling up before they embark on their epic spring migration to the Arctic. These nutrient-rich waters, warmed by the Gulf Stream, are an absolute magnet for whales and other marine life. The islands have a pleasantly warm climate all year round, averaging around 25°C in August, and 16°C in February, so you should be fine with a light fleece and windbreaker. Do bring waterproof clothing however, as the Azores see a fair amount of rain. Whaling was once a major part of the islands’ culture and economy, but thankfully the practise was ended in the 1980s and the Azores transitioned pretty smoothly into whale watching and research trips instead. The annual Whalers Week, a festival beginning on the last Sunday in August, sees decommissioned hunting boats take part in rowing races on Pico, while the island’s whaling museum offers a sobering look at the industry and its personalities. You might not actually see very much of the whales themselves unless they happen to breach right out of the water or come close to the boat.